The burgers are often touted as unhealthy junk food and not friendly to your body. In addition to causing a variety of diseases, the burger is also considered to cause obesity. However, if you still want to eat a burger, you better try making your own, so you are assured of the freshness of food and ingredients used in its manufacture and cleanliness. Moreover, the ingredients to make burgers are easy to find and not complicated to make. Come, see the recipes for these delicious burgers. Stir-fry all the seasoning ingredients prepared with margarine / vegetable oil. Enter the onions and shallots first, then garlic. Then give seasonings such as salt, sugar, pepper and nutmeg. Stir-fry until all ingredients cooked, then remove and set aside. While waiting for seasoning stir the cold, you can prepare the container for ground beef. Then enter the already cold stir and add the flour and eggs that have been beaten off the meat batter. Stir the meat mixture until all ingredients had been mixed and attached. Then put in the fridge for about 10 minutes. If so, print the meat with the shape you want. Heat a pan and Bake meat that has been cooked well up. grab burgers and split into two parts. If so, spread with mayonnaise and then Arrange cucumber, tomato and lettuce on it. After that, apply chili sauce on the cooked meat and place on top of lettuce and sprinkle with grated cheese / cheese sheet on it. For the presentation of the variation, you can add a garnish of fried tight on the edge of the plate . 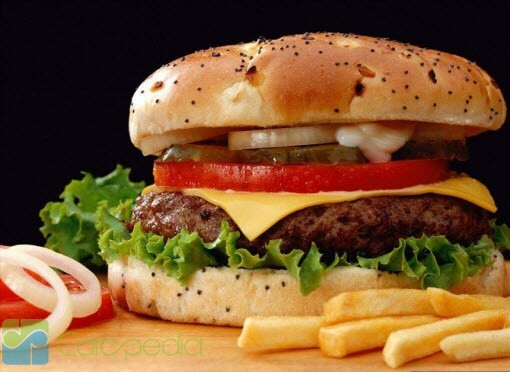 As is the case in Asian countries other Landmarks, in Indonesia, the burger is very popular and well liked, especially by children, adolescents, and young people although the actual burger or hamburger is often called the most popular types of food in America. When the burgers are sold in school canteens, roadside outlets up at the restaurant and cafe. Burger prices also vary widely. One of the local franchise burger outlets even dare to set the lowest price for their burgers at Rp 5,000, - with a sense of quality that is not really very disappointing. Rub with blue cheese dressing, put leaf lettuce, tomato slices, cheese, and bacon burger then cover with a piece of bread burgers and condense. 0 Response to "KUMPULAN RESEP MASAKAN CARA MEMBUAT BURGER DAN CHEESE BURGER "